Apparently Arlene Foster is to spend 50% of the £1 billion on burning all copies of Jurassic Park. Shambolic, but it does make me smile that that billion will be paid by everyone. i.e. Labour voters too. Strawman wrote: Apparently Arlene Foster is to spend 50% of the £1 billion on burning all copies of Jurassic Park. desertweasel wrote: So it looks like the DUP deal is done, only cost the taxpayers 1.5 billion that we didn't have yesterday but magically do today. *Of course there fcuking is. All that QE came from somewhere. That's because countries with their own currencies and central banks are almost completely unlike J. Random Fcukhead and their credit card. Whilst your point is still valid, there is a big difference between spending an extra billion and committing to 50 billion p.a. of extra spending with no way of funding it. And it's 500mpa. A billion over two years. Käsemeister wrote: And it's 500mpa. A billion over two years. Alright, maybe not, but as TT says it's not equivalent to 50bnpa. Käsemeister wrote: Alright, maybe not, but as TT says it's not equivalent to 50bnpa. True but it's amazing how they find this money when they need to for political expediency, but when it's actually necessary, there's no money! Perhaps worth remembering that "they" have also been finding extra money for the NHS every year. Greg66 wrote: Perhaps worth remembering that "they" have also been finding extra money for the NHS every year. thekungfury wrote: Shambolic, but it does make me smile that that billion will be paid by everyone. i.e. Labour voters too. Looks to me like those numbers just keep getting bigger. But the population has grown over the same period and crucially got older as well, in all metrics the NHS is performing worse, especially unfilled vacancies, uncertainty over will only Brexit will make that worse. Greg66 wrote: Looks to me like those numbers just keep getting bigger. Yes because demand increases yearly but the rate of increase should be 4% to keep up, whereas it's 1%. The point, gents, was whether "they" were finding extra money for the NHS each year (in the context of throwing some money at the nutterduppers in NI). You might want to qualify that with "... but they need to find even more", but a "yes, but" is still a yes, and it isn't a no. Greg66 wrote: The point, gents, was whether "they" were finding extra money for the NHS each year (in the context of throwing some money at the nutterduppers in NI). No it isn't. That's the commitment of basic spending that all governments have committed to, in fact they are spending a whole lot less than they should be. You can try to justify this money paid to a bunch of lunatics anyway you like, but this example doesn't equate at all. No it isn't..... in fact they are spending a whole lot less than they should be. I'm just going to leave those bullet points there. Except that's got nothing to do with the DUP. Nice try though. 10 DUP MPs. One independent MP who is also Unionist. 7 Shinner MPs. How much of that £Bazillion do you think is going to find its way into constituencies that returned a "SinnFein/IRA" MP? tanglerat wrote: 10 DUP MPs. One independent MP who is also Unionist. 7 Shinner MPs. This is why I cannot see any resolution to the Stomont assembly, the DUP would much rather that the money was spent by Westminster where they now have real influence, than risk the Nats might get their hands on any of it by reconvening in NI. The Tories of course will have to go along its it, impartiality be dammed. And you think 4% growth in expenditure every year is sustainable? To "keep up". Why don't you ask the King's Fund, or any other health think tank. Or better still don't because I know you think you know best. I don't need to ask the King's fund, that is a matter of simple mathematical fact. Of course, how predictable. Has it ever occurred to you that other people might know more about a subject than you? Sorry to shatter your belief system but our current levels of funding are way below what is required to maintain a sustainable service and are way below what other similar economies pay for healthcare. Your opinion about what is sustainable is frankly irrelevant. Interesting. You believe that i can't comment on health because I am not qualified, but this is a simple matter of maths and economics. Do you have degrees in those? You said that health spending wasn't increasing in real terms. Greg demonstrated it was. You've said that it needs to grow by 4% every year to keep up. That is mathematically not sustainable - fact. Like Greg you didn't read the article he posted or the subsequent one by Strawms. Your facts are pulled straight out of your arse because if you had read the articles you'd see that 4% is the rate of growth that has the NHS has maintained for the majority of its existence. Fact. So it is sustainable, fact. Other economies maintain higher spending than us, fact. You are a Tory bore, fact. And fwiw if you read this thread you'll see I never mentioned NHS spending in relation to the DUP, that was Greg. And wtf is pretty boy? Dare I ask? Last edited by Doctor Congo on Tue Jun 27, 2017 8:33 am, edited 1 time in total. 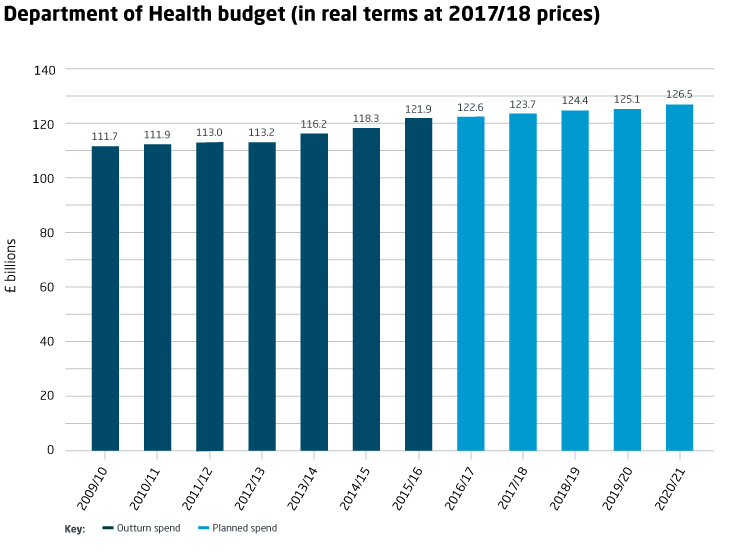 Dirk wrote: You said that health spending wasn't increasing in real terms. Greg demonstrated it was. 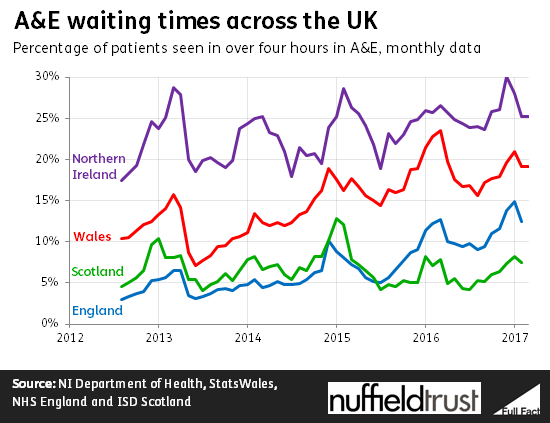 After eight years of austerity the NHS is in crisis, many different commentator have said this, 4% of funding increase, above the rate of inflation but not by much, would ease that crisis. Austerity is not always the answer, the tories have had eight years of cutting public services; the NHS, Police etc. while providing reductions in corporation tax in order to 'boost the economy' the UK has the lowest GDP growth rate in the EU (apart from Greece) so it doesn't seem to have worked. Now they are embarking on an insane policy of Brexit which is going to cost upwards of £100 billion, for no economic benefit, and are willing to bribe their way to doing it all to satisfy a small faction in their own party. Indeed and getting back to the actual issue the deal with the DUP is a particularly grubby bribe to stay in power. It'll be interesting to look back in 10 years and see how much has been sacrificed to satisfy a section of the Conservatives. I am not defending them in any way whatsoever- Tm is an utter embarrassment. My point is simply that there is no comparison between a billion pounds and several hundred billion pounds when the subject is affordability. TO clarify - I fcuking hate all of them at the moment.